In a time in which automakers are cutting out historic brands and selling off niche units, the world’s largest automaker continues to reach out to new markets. In spite of performance problems and criminal negligence, people still keep buying Toyotas and Lexus automobiles, so Toyota will keep making them. 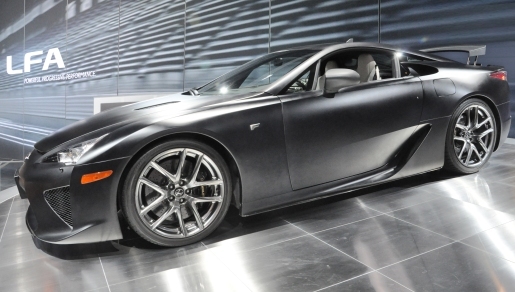 In fact, they’re expanding their reach, with Toyota’s first ultra-luxury car, a $350,000 Lexus called the Lexus LFA. The LFA is Maserati priced, so drivers should expect Maserati performance. We’re talking 0-60 in 3.6 seconds. We’re talking a top speed of 202 miles an hour. We’re talking a 552-horsepower engine. We’re talking a coolness test. Wait, what? That’s right, to drive the Lexus LFA, you have to pass a coolness test, according to Lexus College national manager Paul Williamson. “We want people who will drive the car, who will be seen in the car. We want it to be seen on the right roads, in front of the right restaurants and not just being enjoyed by one individual in their private garage,” Williamson says, thereby eliminating Jay Leno from contention. Lexus will choose the LFA’s 500 owners on criteria such as where they live, other cars they own, where they drive, and how often they drive. I can already tell you this car is cooler than anyone I will ever know.